Kim Churchill’s live show illuminated his freakish talent with multiple instruments. 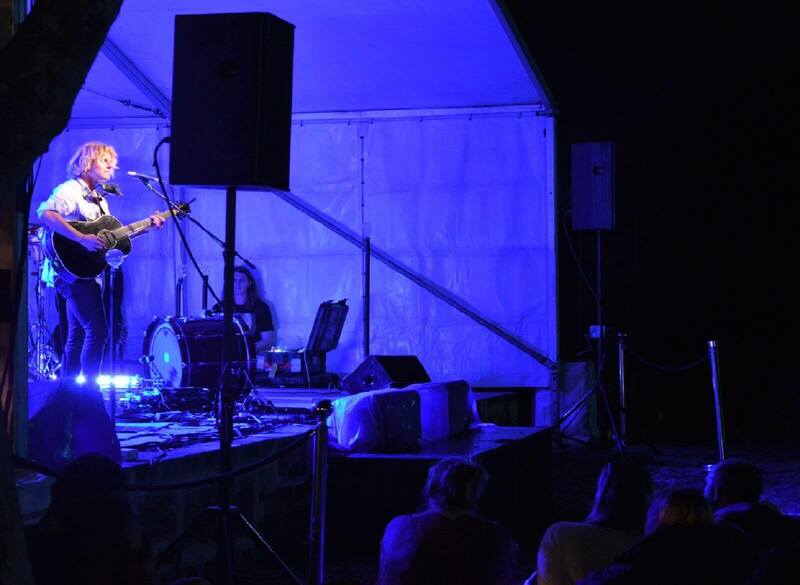 In case you missed out on Kim Churchill kicking off the WA leg of his Weight Falls tour, we still get chills thinking about it. Fremantle Arts Centre was the ideal venue with its leafy majestic trees acting as a shield from the rain, crowds were sprawled around the centre’s front lawn, ready to welcome the talented multi-instrumentalist from New South Wales. Kim Churchill’s current album and tour are fascinating for a number of reasons. Firstly, his album, Weight_Falls, was essentially written in one week; the 26-year-old initially spent eighteen months crafting an album, only to discard it at the last minute after realising it didn’t feel ‘right’. Secondly, the Weight Falls tour marks Kim’s first foray into bringing other people onstage - namely, Michael Hardy and Tom Myers, both talented drummers and singers. And with the set’s first three songs - Whole Entire, Goes Away and Golden - it quickly became evident that this decision was paying off, with the percussion adding drama and depth. “I don’t want to be the punishing headline act saying you have to dance,” joked Kim three songs deep, encouraging the crowd to feel free to do whatever they like, whether that be sitting down, dancing or singing along. This was all the prompting the audience needed; a dance floor quickly formed in front of the stage, with people rushing from all corners of the lawn to sway and bop to Kim’s tunes. Kim’s live show illuminated his freakish talent with multiple instruments, as he deftly alternated between guitar, snare drum, and harmonica all at once; soaring harmonica solos in Window To The Sky earned appreciative roars from the crowd. However, his more mellow tunes were equally memorable. “This is a song about a man called George,” was how he introduced his song Rosemary. He went on to tell the poignant tale of how an elderly man fell in love with Kim’s grandmother in hospital, getting to know her and keeping her company over the last week of both of their lives. The set ended on a high with an acoustic encore performance of his album’s titular track, Weight Falls. Unplugged and with all three gathered around one condenser mic, Kim and his two drummers proved that this stage show is one not to be missed, with an abundance of instruments, emotion and stories packed into one hour and fifteen minutes.